After the recording sessions, Gene plays a one week residency at the Casino in Toronto in Canada, where Bob Benson, a guitarist from Boston MA, plays lead guitar. …Cliff Gallup also leaves. 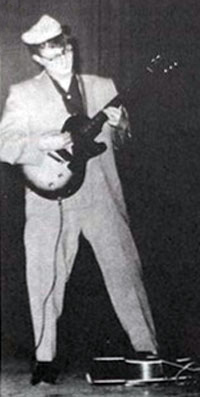 Russell Williford is drafted in to play lead guitar at two gigs at the Casino Royale in Washington before flying to Hollywood to mime with the group in the movie. After this, the group embarks on a mini tour including dates in the mid-west, New York, and The Casino in Toronto in Canada. After the recording sessions, Gene plays a one week residency at the Criterion Theatre in Toronto in Canada, where an unidentified guitarist from Boston MA plays lead guitar. Russell Williford returns and Teddy Crutchfield joins to play rhythm guitar for a Canadian tour and a residency at the Sands Hotel in Las Vegas NV.